Where are the Eastern Conifers? Out West, conifers typically dominate. The deserts are rife with junipers and pinyons, tough enough to survive as shrubs with little in their tin cups. The redwoods and sequoias outgrow skyscrapers in their respective homelands. Lodgepoles and pondos enjoy entire pure stands where little else can compete with their tenacity over long periods left uncut. But out East, I find far fewer conifers (ie, pine trees). So I pondered why. At first, I assumed elevation. Conifers seem to prevail in the west on the higher slopes of the Sierras and Rockies, where oak forests like those found in the valleys of California still run the show at lower. But the redwoods themselves grow at nearly sea level, as do Sitka spruce and shore pine, which often dominate their respective homelands. So while elevation may play a role–even in the east’s Black Mountains, the tallest this side of the Mississippi, ancient firs and spruces found nowhere else in the world prevail–the revelation that unfolds is mankind’s influence. When a forest is cut, particularly clearcut, broadleaf trees from willows to birches grow quickly. Some trees, such as aspens, continue to live through a single root system underground even as the bulk of the tree is removed. And there are few old growth forests, those which have never been cut by man, in the east. 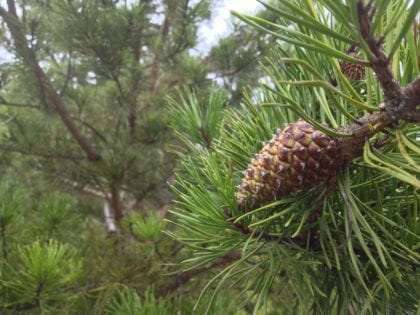 Since many conifers require a long period to establish dominance and gain the necessary height to live long lives, they are eternally being replaced by broadleaf trees, which grow quickly, are clearcut again, and the process continues. Still, if you seek you’ll find, and we recently had a chance to see an amazingly lush forest of hemlocks and white pines in Swallow Falls, Maryland’s sole remaining virgin forest.